February 15, 2016 — In northwestern India, the Himalaya Mountains rise sharply out of pine and cedar forests. The foothills of the Kullu Valley are blanketed with apple trees beginning to bloom. It’s a cool spring morning, and Lihat Ram, a farmer in Nashala village, shows me a small opening in a log hive propped against his house. Stout black-and-yellow native honeybees — Apis cerana — fly in and out. 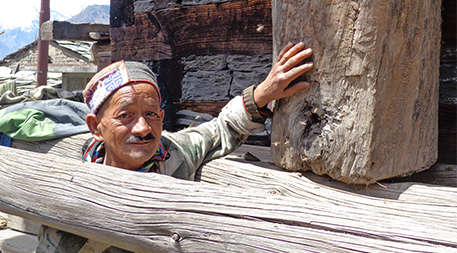 For centuries beehives have been part of the architecture of mountain homes here, built into the thick outside walls. Traditionally wild colonies of bees found the hive themselves, or farmers brought a log with a hive in it from the surrounding forest so the inhabitants could set up shop in the village and produce honey for their human caretakers. But in recent years those wild colonies have become increasingly rare in this valley, where 90 percent of farmers are small landholders. Modern agriculture has replaced natural forests and the diverse crops of subsistence farms almost exclusively with a single apple variety: royal delicious, favored at the market. Producing this high-demand fruit has improved economic conditions for farmers in the Kullu Valley. But it also has contributed to an untenable environment for pollinators. Similar to other situations around the world, a mix of monocropping, climate change, diseases, changes in land practices, pesticide use, deforestation, loss of habitat and an exploding human population that’s taxing the valley’s natural resources has caused native honeybee populations to decline. With the decline, orchard harvests have dropped by as much as 50 percent. To close the pollination gap, farmers who could afford it started to hire beekeepers from the neighboring warmer state of Punjabi to bring managed hives of European honeybees — Apis mellifera — to the valley during the apple bloom season. “The problem with this is that poor farmers are now paying for an ecosystem service that the native honeybee previously provided for free,” says Pradeep Mehta, research and program manager for Earthwatch Institute in India. Not only that, but the introduction of nonnative honeybees can bring with it disease and competition for nectar sources, reducing some populations of native bees even further and robbing ecosystems of important biodiversity. Now, however, scientists are enlisting nature to turn that around in this remote corner of the world. The Himalayan Ecosystems Research Project — a collaboration among scientists, Nashala villagers and international volunteers like me brought in by Earthwatch — is studying pollination in this area and applying what’s learned at the farm level. Last year, the group began restoring traditional pollinator services with trainings and stocking new hives with native Asian honeybees, as well as introducing modified practices, such as using an extractor to harvest honey rather than crushing hives, that boost the bees’ ability to thrive under their modern circumstances. To feed the Asian honeybees throughout the growing season, Nashala village farmers have started to diversify their farms again. Garlic, onion, cauliflower and wildflower varieties that pollinators have shown a preference for in field research now grow under the apple trees — after the trees bloom. The distributed flowering strategy keeps the bees focused on pollinating apples during their short bloom season while still providing a variety of nectar sources that help keep them going during the rest of the growing season. Worldwide, cultivation of — and collaboration with — native bees through traditional beekeeping is fast becoming collateral damage of modernization. Industrial agriculture employs only a handful of pollinator species to sustain it, mostly uber-efficient honeybees and bumblebees that are toted from one farm to the next to provide pollination when and where needed. By restoring beekeeping, farmers increase the numbers of local bees available not only to pollinate their crops but also to reclaim their role as an integral part of surrounding habitats.Now, though, there’s a revival underway — an awakening to the value of native-bee-nurturing subsistence practices around the world. As in the Kullu Valley, farmers are starting to recognize local pollinators as valuable partners in their enterprises and once again actively cultivate bees. By restoring beekeeping, farmers increase the numbers of local bees available not only to pollinate their crops but also to reclaim their role as an integral part of surrounding habitats. “Reviving these practices will help in pollinator conservation and also help in sustaining agriculture in the region,” says Mehta. Residents of the Yucatan Peninsula of Mexico have reared stingless bees for a thousand years, according to cultural records. Traditionally, Mayan beekeepers collected the bees, which they call xunan kab (royal lady), from the forest by cutting down trees and bringing the hive home in a portion of the trunk. The small amount of honey produced, one to two liters (0.3 to 0.5 gallons) per year, was used for medicinal purposes, and the queens had a role in ceremonial practices. Mayan elders used to pass on their beekeeping knowledge to an interested relative. As modernity has swept through the culture, the practice has gone out of fashion. “Kids aren’t interested in traditional things,” says David Roubik of the Smithsonian Tropical Research Institute. Since the 1980s, Roubik, along with University of Arizona entomologist Stephen Buchmann and Rogel Villanueva-Gutiérrez, a research scientist at El Colegio de la Frontera Sur in Mexico, has been studying Mayan beekeeping and native stingless bees of the genus Melipona in the Zona Maya, a government-designated region in the Yucatan where Mayans maintain a traditional lifestyle. New beekeepers are mostly interested in making money, and for that they turn to a commercial bee, a hybrid of European and African honeybees that cranks out 100 pounds (40 to 50 kilograms) of honey per colony per year. On the eastern side of the Yucatan Peninsula, where large swaths of native forests are still intact, scientists interested in restoring that function are working with Mayan farmers to revive traditional beekeeping. The researchers’ long-term studies of bee populations and surveys of beekeepers in remote Mayan villages showed that the practice is no longer being passed down through families. 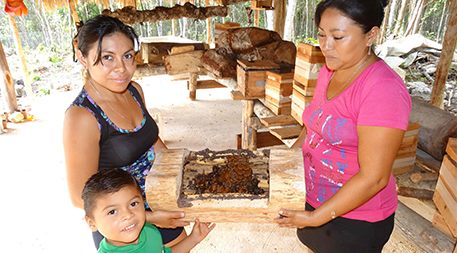 To help preserve a tradition they saw as essential to preventing local extinction of these stingless bees Buchmann, Roubik, Villanueva-Gutiérrez and other colleagues from the University of Yucatan started annual workshops to train a new generation of beekeepers. “We train and work with Mayan technicians to give courses and workshops on how to manage and protect the Melipona bee. We supply colonies to people that are just starting and build bee houses, called meliponaries, which have all the characteristics of the traditional Mayan meliponaries,” says Villanueva-Gutiérrez. Buchmann, Roubik and Villanueva-Gutiérrez have also published a stingless beekeeping guide in Spanish and Mayan and a video on Mayan beekeeping. The hope is that skilled beekeepers will increase the number of colonies by dividing them. Traditionally men tended the bees in Mayan villages, but women’s beekeeping collectives have sprung up from these new efforts. The bee’s docile nature makes it an appealing addition to a backyard family farm. The honey’s renowned medicinal value and appealing packaging helps it to fetch more money per liter on the market than honey from commercial bees. For some mothers, it’s enough to pay for their child’s education. The workshops help beekeepers recognize that honey is only part of the benefit. “We make people aware of the importance of bees for the conservation of the forest, and also the importance of the forest for the existence of bees,” says Villanueva-Gutiérrez. In this way, stingless bees are helping sustain Mayan beekeepers with the sale of honey, and the Mayan beekeepers are helping sustain not only stingless bees but also the ecological integrity of the Yucatán Peninsula. In Tanzania, traditional practices have focused on harvesting wild honey rather than keeping managed hives, says Noah Mpunga, a zoologist with the Wildlife Conservation Society. Farmers search the forest for hives, then ignite bunches of grass to smoke the aggressive African honeybees out of their hives before they harvest the honey. Sometimes fires drip onto the ground and set forests ablaze, destroying habitat and the hives. A new Elephants and Bees Project, brainchild of biologist Lucy King, aims to support smallholder farmers with income from honey sales and reduce human-elephant conflicts by putting the belligerent nature of African honeybees to good use. Using traditional log hives or modern top-bar hives, which allow farmers to harvest honey without damaging the colony, the project helps set up beehive fences around smallholder farms. Migrating elephants eyeing fresh, green vegetation on small farms run into wires connecting hives, mobilizing the bees. Just the sound of the bees buzzing puts the elephants on the run. 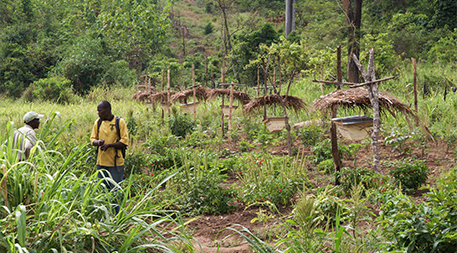 Smallholder farmers benefit not only from the protection from elephants afforded their crops, but also from the added pollination services the bees provide as well as from harvesting the abundant honey. Local biodiversity benefits, too: The program encourages beekeepers to create and protect foraging sources for the native bees by planting wildflowers among their crops and conserving nearby native forests. Research shows that proactive conservation strategies such as this can maintain the favorable conditions and populations of native bees throughout Africa, and the practice is spreading to other locations where elephants are a problem. Back in India, I follow Lihat Ram through the narrow paths of Nashala village. A few wall and log hives buzz with active Asian honeybee colonies. We pass women in colorful clothing planting vegetable crops in their yards. Out in the orchards, wildflowers are beginning to bloom under the apple trees. Honeybees, native solitary bees, flies and butterflies flit about pollinating apple blossoms. Whether it’s tasting a new apple variety from the Kullu Valley, using Royal Lady honey as skin lotion in the Zona Maya, watching African elephants make a beeline for the hills or something else somewhere else, native pollinators have much to offer humans and local ecosystems alike. Including traditional beekeeping practices in bee conservation efforts may be exactly what we need to keep our agriculture systems, forests and farmers thriving. Editor’s note: Christina Selby participated in the Earthwatch volunteer program in India last April and produced this feature as a participant in the Ensia Mentor Program. 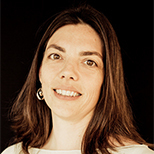 Her mentor for the project was Hillary Rosner. We sent over 1 Million Milkweed Seed Packets in 2015. We expect to send over 2 Million in 2016. While native bees surveys are lacking in some areas of the world so their populations are less known, Apis Mellifera known as the honey bee is actually not in decline. Publications like this that should know better, NYT, Ntl Geo and smithsonian all keep repeating this claim that's factually false. I the American Southwest, We are invasives, along with our crops and our bees. There is no ancient tradition to fall back on, unless you wish to count the Anasazi. Brian - perhaps you can explain why countries and organisations around the world are working so hard to alleviate and reverse a bee decline that you say does not exist. I suppose CCD is also a figment of the imagination. Perhaps the bee keepers left their bees somewhere and forgot about them. Thank you for volunteering to save the Bees, sharing your acquired knowledge of ancient beekeeping practices, and in writing this article to further inform others of this imperative crusade to save these sweet pollinators. Bees are so crucial for agriculture, our planet and responsible for creating sweet enjoyment from the honey they produce. My husband and I have taken a recent interest in further researching the decline in bees, the colony collapse disorder, and supporting local beekeepers. Bee Friendly and buy honey locally as it helps to support local farmers and in turn encourages local growth to the Bee colonies in your town or city. It’s a win-win for all. On a slight side note, be conscious of imitation honey products when shopping as these can be riddled with chemicals, made synthetically or are simply a thin, runny syrup labeled as honey. To avoid this almost entirety, it’s advised to buy honey locally! “Rotten” is a insightful Netflix original series with an episode specifically focused on Honey and it’s production. I highly recommend watching this episode if you are interested whatsoever in Bees, honey and/or further educating yourself about food production. Thank you for taking the time to volunteer and write this informative and interesting article. Keep up the great work and best of luck in further spreading the news buzz for the Bees!